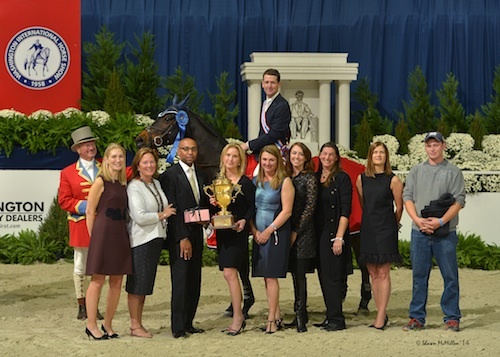 Washington, D.C. – October 25, 2014 – McLain Ward (USA) and HH Carlos Z raced to victory Saturday night in the $125,000 President’s Cup Grand Prix CSI 4*-W, presented by Events DC, at the 56th annual Washington International Horse Show (WIHS). 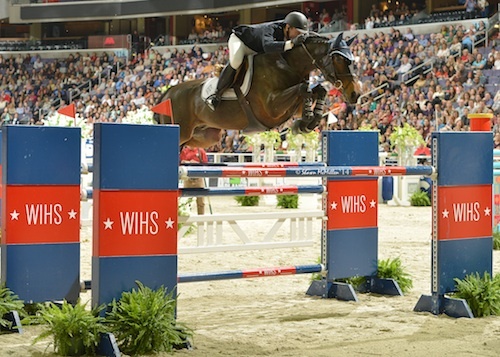 Competing at Verizon Center in downtown Washington, D.C., Ward will have his name etched in WIHS history for now winning the coveted President of the United States Perpetual Cup four times in his illustrious career. 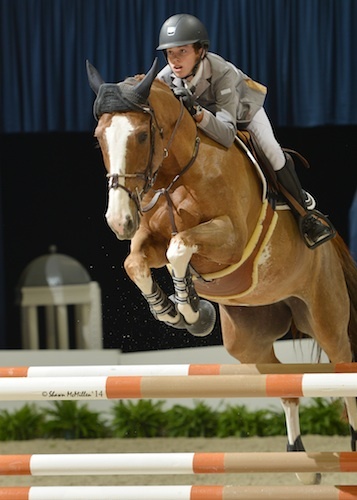 The Longines FEI World Cup qualifying grand prix was the highlight event of the week at WIHS as competition concludes on Sunday with the Pony Hunters, WIHS Pony Equitation Finals, and WIHS Regional Finals. 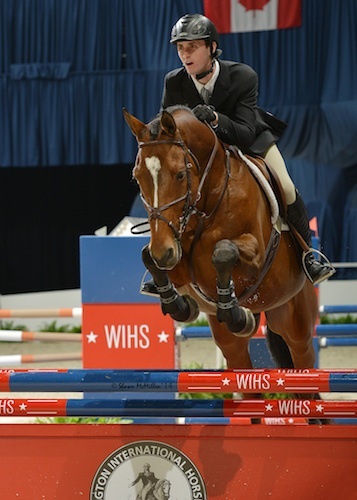 Also competing on Saturday, Michael Hughes won the 2014 WIHS Equitation Finals. 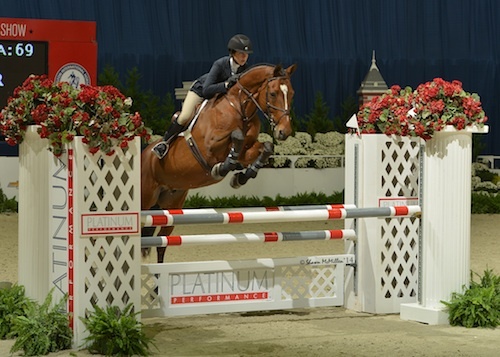 Victoria Colvin and Chanel B 2 won the $15,000 SJHOF Ambassador’s Cup High Junior/Amateur-Owner Jumper Classic, and Lucas Porter and Psychee d’Amour topped the $7,500 Senator’s Cup Low Junior/Amateur-Owner Jumper Classic. Course designer Anthony D’Ambrosio set the tracks for jumper competition throughout the week at Verizon Center. In Saturday night’s grand prix, he saw 26 entries and just four were able to clear the first round course without fault. 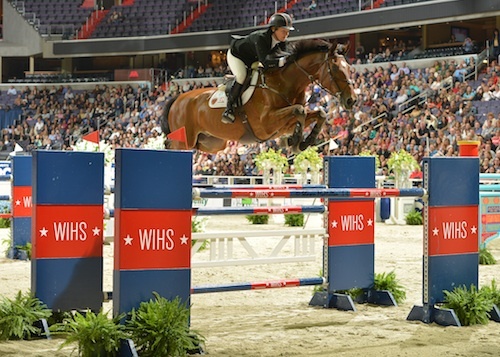 Rising star Jessica Springsteen, two-time Olympic gold medalists McLain Ward and Beezie Madden, and young Olympian Reed Kessler made up the star-studded line-up of American show jumpers to jump-off to the thrill of a packed house in their nation’s capital. Springsteen and Stone Hill Farm’s Davendy S were the first combination to jump clear in round one and set the pace in the jump-off with a clear round 34.30 seconds to eventually finish second. Kessler jumped next with Kessler Show Stables LLC’s Cylana and had one rail down in 35.50 seconds to earn fourth place honors. Ward and Double H Farm’s HH Carlos Z followed, and upped the ante with the winning round in 33.52 seconds. Madden and Abigail Wexner’s Simon were last to go and beat Ward’s time in 33.48 seconds, but dropped a rail to place third. 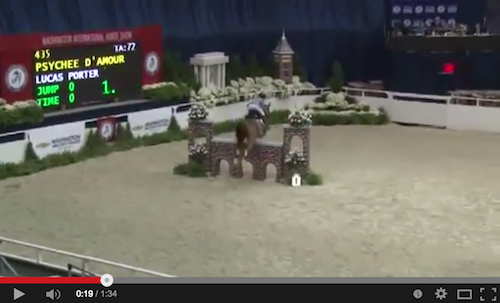 Watch McLain Ward and HH Carlos Z in their winning round! Saturday’s win marks the fourth time that Ward has earned the coveted President’s Cup after topping the competition with Goldika 559 in 2004 and twice with his superstar mount, Sapphire, in 2008 and 2010. The win with Goldika was for owners Double H Farm and after a few years apart, Ward has once again renewed his partnership with the Harrison Family. They are the owners of HH Carlos Z, the winning 12-year-old Zangersheide gelding (Chellano Z x Voltaire). 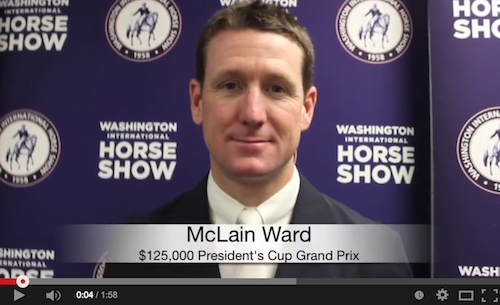 Watch an interview with McLain Ward! 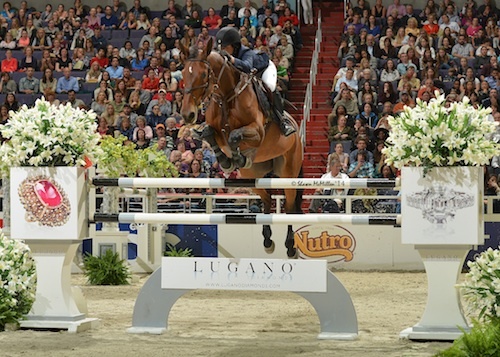 Jessica Springsteen’s second place finish concluded a phenomenal week of competition for the 21-year-old rider with wins in Wednesday’s $10,000 Welcome Stake, Thursday’s $20,000 Gambler’s Choice, and Friday’s $25,000 Puissance. Springsteen swept the show’s international jumper championship sponsored by Robin Parsky, earning the championship with Lisona and the reserve champion with Davendy S. She was also presented with the $15,000 Leading International Jumper Rider Award, sponsored by The Boeing Company, along with the Margaret Chovnick Memorial Trophy, and the $10,000 Leading Rider 25 Years of Age and Under Award, sponsored by Sleepy P Ranch. 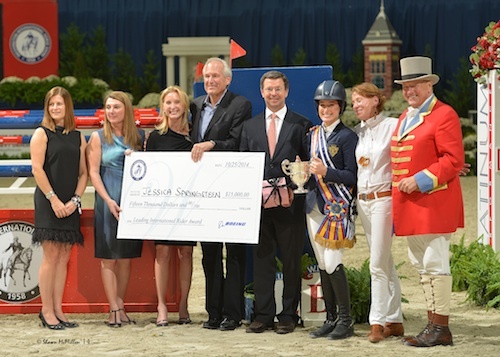 The Springsteen Family’s Stone Hill Farm was the Leading Jumper Owner sponsored by The Reid Family. Belgium’s Olivier Philippaerts was named Leading Foreign Rider after winning Friday’s $50,000 Speed Final. 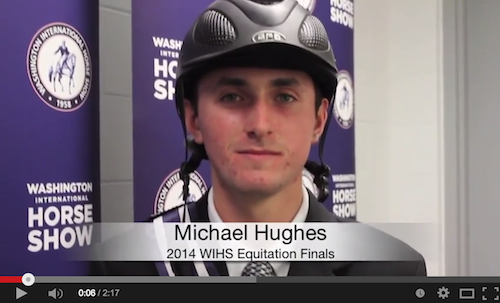 The 2014 WIHS Equitation Finals concluded Saturday evening with a win for Michael Hughes (18) of Allendale, NJ. Hughes rode Jordyn Rose Freedman’s Finnick through the first two phases of competition, finishing with a score of 88.50 in the hunter phase and 90.25 in the jumper phase. Returning for the final work-off sitting in second place overall, his ride aboard Mckayla Langmeier’s mount Skyfall scored a 93.50, giving a three round total of 272.50 for the win. He is trained by Missy Clark and John Brennan at North Run along with Linda Langmeier. 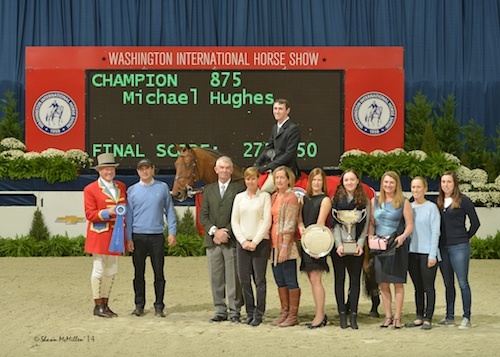 For his win, Hughes was presented with the WIHS Equitation Classic Trophy donated by Mr. and Mrs. G. Ralph Ours, III. Finnick was awarded The Lugano Memorial Trophy donated by Stoney Hill as the winning horse of the night. Hunter Holloway of Topeka, KS, finished second with a 267.375 total. Holloway rode Hays Investment Corp.’s Any Given Sunday in the first two rounds with a score of 89.13 in the hunter phase and 89.75 in the jumper phase. Her final work-off round aboard Caitlin Boyle’s mount Loredo scored an 88.50. Mckayla Langmeier of E. Granby, CT, placed third with scores of 86.75 and 89.50 riding Linda Langmeier’s Skyfall in the first two rounds and a 90 in the final work-off aboard Michael Hughes’ mount Finnick to total 266.250. Hughes had no experience with either of the horses he showed in the competition this week, but the rider’s talent and experience guided both of his mounts to great rounds. Finnick was a borrowed ride just before the final, and the seven-year-old Westphalian gelding (by Cayetano L) excelled. Watch Michael Hughes and Finnick! Hunter Holloway was on a horse that is new to the equitation ring with Any Given Sunday, who is usually her mother’s grand prix mount. Last week in Harrisburg was the horse’s first equitation show, and he has taken to the discipline easily. Watch Michael Hughes and Skyfall! Trainer Missy Clark spoke about her team’s preparation for the competition and her confidence in Hughes’ ability going into the final. He also won the Platinum Performance/USEF Show Jumping Talents Search Finals in 2013 and has been very successful throughout his junior career. 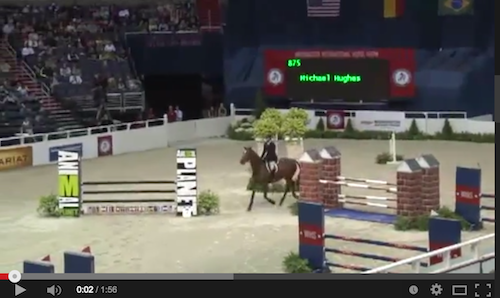 Watch an interview with Michael Hughes! The $15,000 Ambassador’s Cup High Junior/Amateur-Owner Jumper Classic, sponsored by Ellen and Daniel Crown, saw a win for Victoria Colvin (17) and Karen Long Dwight’s Chanel B 2 on Saturday afternoon at WIHS. Colvin, of Loxahatchee, FL, rode the nine-year-old Mecklenburg mare (Cellestial x C-Indoctro) to victory to earn The Ambassador’s Cup Perpetual Trophy donated by Ambassador and Mrs. Marion H. Smoak. The Ambassador’s Cup saw 21 entries with six to jump-off and only two double clear rounds. First to go over the short course, Colvin and Chanel B 2 set the pace at 33.96 seconds that would hold up for the win. Two riders were faster, but incurred faults along the way. Chloe Reid was the only other competitor to go clear in the jump-off with Chloe D Reid LLC’s Windbreaker and finished second in 34.52 seconds. Lauren Fischer and Offenbach du Granit had the fastest four fault round in 33.02 seconds to earn the third place prize. After Saturday’s win and a second place finish in Friday’s jump-off class, Colvin and Chanel B 2 were also awarded the High Junior/Amateur-Owner Jumper championship, sponsored by Ellen and Daniel Crown. They were presented the Greenberg Challenge Trophy donated by Mr. and Mrs. Hermen Greenberg. Colvin, who trains in the equitation and jumpers with Andre Dignelli, began riding the mare this winter. 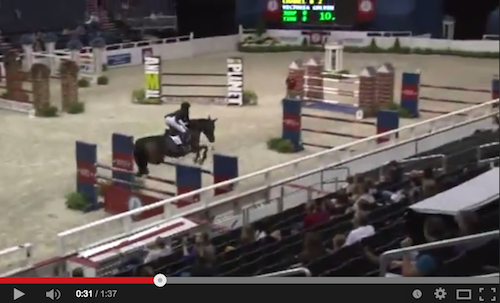 Watch Victoria Colvin in her winning classic round with Chanel B 2! Karen Long Dwight purchased Chanel B 2 for Colvin to ride at the end of the Florida circuit this winter. The mare had been with German rider Andre Thieme showing at the 1.45m level, and Colvin knew the mare had experience indoors with him. Hunter Holloway and Hays Investment Corp.’s I Love Lucy were the High Junior/Amateur-Owner Jumper reserve champions after winning the first two classes of the division. Holloway was also presented with the 2014 SHALANNO Style of Riding Award. The award is presented each year to the Junior Jumper rider who best exemplifies the American style of equitation and the respectful, dignified manner of a true sportsman. Earlier on Saturday, Lucas Porter and Sleepy P Ranch LLC’s Psychee d’Amour jumped to a redeeming win in the $7,500 Senator’s Cup Low Junior/Amateur-Owner Classic, sponsored by The Strauss Family. Not only is Psychee d’Amour coming back from an injury that sidelined her for two years, an unlucky rail yesterday left the duo with only one choice to secure Champion: win the Classic. Porter finished clear in 37.211 seconds. The Classic blue guaranteed them Champion honors and earned Porter the Foxbrook Perpetual Trophy donated by Joy Slater in honor of Space Citation. Saturday’s win combined with a first and seventh-place ribbon gave them a total of 25 points. For the Classic win, he was presented the Swan Lake Perpetual Trophy, donated by Beagle Brook Farm, in honor of the 1992 winner Swan Lake ridden by Jennifer F. Miller. 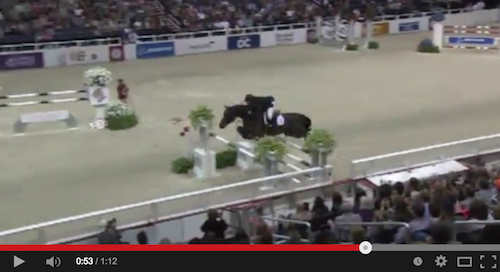 Watch Lucas Porter and Psychee d’Amour in their winning classic round! Porter was one of nine to return over the short course from an original field of 23 in the Classic. The first double clear came five trips into the jump-off when Yasmin Rizvi and Heritage Farm’s Vivell-C crossed the timers fault-free in 38.959 seconds. One of only two to best the jump-off, Rizvi finished second, while Sima Morgello and Zopala, owned by Double S Farm, were the fastest of the four-fault rounds to take third. Morgello also earned Reserve Champion with 12 points. To that end, Psychee d’Amour will rest between WIHS and the Winter Equestrian Festival in Wellington, FL, while Porter’s other mounts head to The National Horse Show in Kentucky. This winter, Porter will focus her on the Medium Jumpers. While showing full time, 17-year old Porter is a junior in high school and attends classes through Stanford University Online High School. Coupled with success in the show ring, he is also making plans for his future. Considering coursework in Engineering and Architecture, he has his sights set on attending Stanford University, or following in the footsteps of his older brother to Vanderbilt. “They are my top two, but they are also really hard to get into, so I just have to study hard,” he concluded. Porter hails from Texas, but now calls Wellington home under the direction of his parents, trainers John Roche and Chelsea Sundius, as well as groom Oscar Marin. 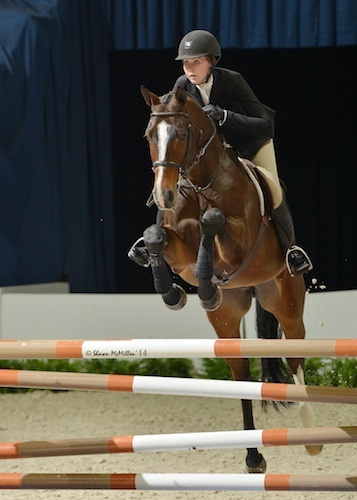 The Washington International Horse Show concludes on Sunday with a day full of pony competition as well as the WIHS Pony Equitation Finals and WIHS Regional Finals. The final day of competition will be live streamed, sponsored in part by The Nutro Company, at www.wihs.org and www.usefnetwork.com. For full results, please visit www.wihs.org.